HIROSHIMA - At least two people are dead and almost 70 injured following a 12-vehicle pileup inside a highway tunnel in Higashihiroshima, Hiroshima Prefecture, on Thursday. 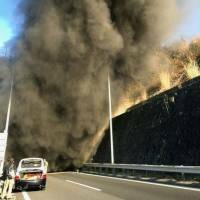 Five vehicles caught fire following the pileup, which was triggered after a truck slammed into a vehicle about 7:30 a.m. on the Sanyo Expressway, police and firefighters said. Of the two people killed in the accident, one was identified as Setsue Maruoka, 65, from the city of Takehara. The other, who was found dead inside a burned vehicle, remained unidentified. While most of the injuries were believed to be minor, at least two people were in intensive care and five others were hospitalized for burns and carbon monoxide poisoning, according to the hospital treating them. The pileup caused traffic chaos in the tunnel, which already had a lane closed due to a separate accident involving two trucks at around 4:30 a.m., according to police and highway officials. 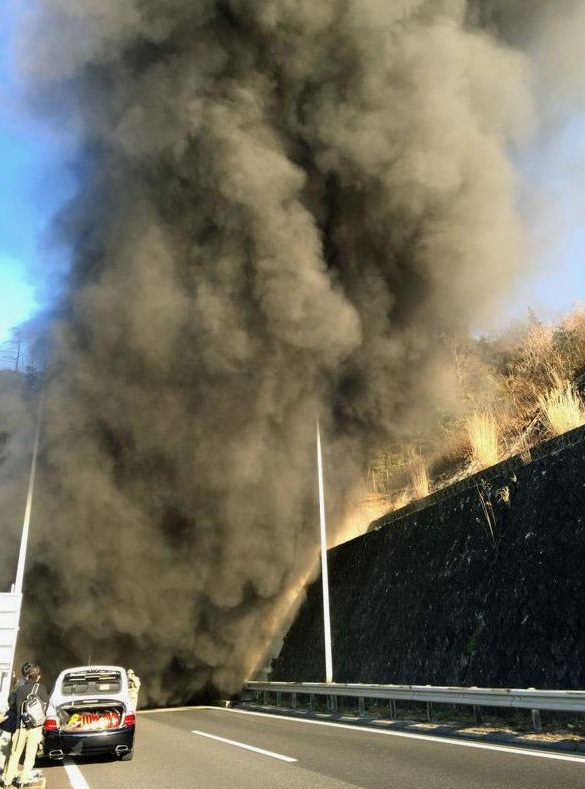 The pileup occurred about 200 meters into the 840-meter tunnel, causing black smoke to stream out of an entrance until the fire was extinguished an hour later. No sprinklers were installed inside the tunnel, but fire extinguishers were installed every 50 meters, authorities said. The tunnel is located about 10 km northwest of Higashihiroshima Station on the Sanyo Shinkansen Line. Rescue workers set up a makeshift tent near the tunnel where the injured waited to be transported to hospitals. People were taken by ambulance or a bus organized by the fire department, depending on the seriousness of their injures.